After months of suspense and sneak previews, Nokia has finally launched its flagship smartphone, N8, after almost four months of delay from its launch date. Experts put N8 as Nokia’s challenge against the iphone by Apple Inc. The popularity of this latest smartphone can be seen by the fact that it has received the highest numbers of pre-orders in the history of Nokia. What makes Nokia N8 stand out above all its competitive phones is its 12 mega pixel camera with Carl Zeiss lens. With 256 as internal memory and a screen resolution as big as 640x360 pixels, this smartphone is sure to stay in the market for long. Apart, it has an expandable memory of a whooping 48GB which is good enough to store as much as 400+ movies. To add to this, it comes with three separate home screens and the user can toggle between them by swiping the screen to the left or right. Different shortcuts can be put on every home screen as per the user’s convenience. And if you do not like crowded home screen, you get the option of keeping the home screen blank with just the image in the background. Nokia has also made surfing through social networking sites, Twitter and Facebook, much easier with the widget available supporting both the apps. Moreover, with the BBC iplayer app, one gets to watch live TV programmes on the go via Nokia web browser. Another fantastic addition to this latest Nokia smartphone is the notification widget that lets you scroll through recent calls, messages and other updates. The new spice here is that the user gets to read the messages without actually opening them up, all with this fantastic widget. The phone is totally user friendly as it allows the user to customize the phone to a great extent as per his needs. Available in half a dozen color options, Nokia has made some more specific changes to this wonderful smartphone for a better experience to the user. The web browser of this phone supports video streaming that allows the user to watch videos on youtube and many more sites, unlike previous Nokia handsets that were not blessed with this feature. Beside this, the zoom in and out feature is now much easier as the user can zoom in to the camera by just putting the finger and the thumb together and zoom out by moving them apart. 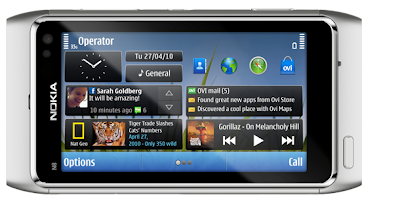 Features like Wi-Fi and GPS in the phone are always of great help for the user. It is not the features that set this phone apart but the speed at which it operates. 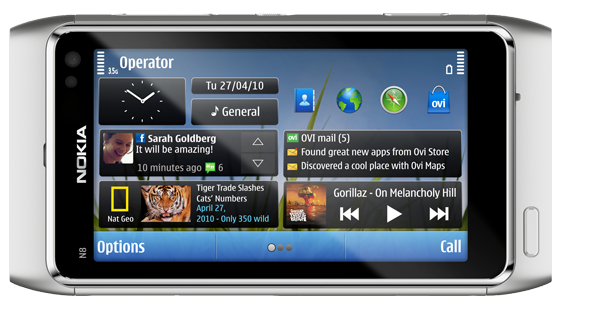 Nokia N8 uses Symbian ^3 operating system that allows the user to have the best experience while operating the phone. Further, there is no need to double tap a particular icon to open it, like the previous touch series phones of Nokia, as the icons open with a single tap. To be specific, all these are enough to describe the highly profiled Nokia N8.